For other people named Zaynab, see Zaynab (disambiguation). Zaynab bt. ʿAlī (Arabic: زینب بنت علي) the daughter of Imam Ali (a) and the Lady Fatima al-Zahra' (a), and 'Abd Allah b. Ja'far's wife. She and her two sons accompanied Imam al-Husayn (a) on the Event of 'Ashura' where her two sons were martyred and she was taken as captive to Kufa and then to Damascus. Her sermons in Kufa and Damascus (in front of Yazid) are very famous. Due to many sufferings she had undergone, she was called as Umm al-Masa'ib (mother of calamities). She passed away in 62/682. She is the daughter of Imam 'Ali (a) and the Lady Fatima al-Zahra' (a). Her most famous name is "Zaynab", which literally means "a scenic tree with a beautiful fragrance". Zaynab is also a compound of two words "zayn" (adornment) and "ab" (father), meaning the adornment of the father. She was born on Jumada I 5, 5 or 6/October 5, 626 or September 25, 627 in Medina. According to several hadiths, the Prophet (s) named her Zaynab. It is said that Gabriel brought this name from God to the Prophet (s). When the Prophet (s) held her for the first time, he kissed her and said, "I advise the present and the absent of my Umma to honor and respect this girl as she looks like Khadija (a)." Many titles have been reported for her such as 'Aqilat Bani Hashim (wise woman of Banu Hashim), 'Alima Ghayr Mu'allama (the knowledgeable without being taught), al-'Arifa, al-Muwaththaqa (trustworthy), al-Fadila, al-Kamila (perfect), 'Abida Al 'Ali (worshiper of the family of 'Ali), al-Ma'suma al-Sughra, Aminat Allah, Na'ibat al-Zahra' (representative of Zahra'), Na'ibat al-Husayn, 'Aqilat al-Nisa', Sharikat al-Shuhada', al-Baligha, al-Fasiha, and Sharikat al-Husayn. Due to the hardships she suffered during her life (demise of the Prophet (s), sufferings of her mother and her martyrdom, martyrdom of her father, Imam 'Ali (a), her brother, Imam al-Hasan (a), the event of Karbala, martyrdom of her brother, Imam al-Husayn (a) and her two sons and her other relatives, going to Kufa and Damascus as a captive) she was titled as Umm al-Masa'ib (lit, mother of calamities, referring to the numerous miseries she was inflicted with). Zaynab married Abd Allah b. Ja'far al-Tayyar (her cousin) in 17/638. She gave birth to four sons named: 'Ali, 'Awn, al-'Abbas and Muhammad, and one daughter named: Umm Kulthum. Muhammad and Awn were martyred in Karbala. Mu'awiya asked to marry Yazid to Umm Kulthum but Imam al-Husayn (a) married her to al-Qasim b. Muhammad b. Ja'far b. Abi Talib (Umm Kulthum's cousin). Her utterances and sermons, which are full of demonstrations from the Qur'an, in Kufa and the court of Yazid, show how knowledgeable she was. She has narrated hadiths from her father, Imam Ali (a), and her mother, Lady Fatimat al-Zahra (s). Muhammad b. Amr, Ata' b. Sa'ib, Fatima bt. al-Husayn, and other narrators have narrated hadiths from her. During the residence of Imam Ali (a) in Kufa, Zaynab held sessions on exegesis of the Qur'an for women of Kufa. Her sermons reminded the audience of the sermons of her father, Imam Ali (a). Her sermons in Kufa, in front of Ubayd Allah b. Ziyad, and in the court of Yazid are very similar to those of Imam Ali (a), and the Fadakiyya sermon from her mother Fatima (a). She would worship at nights. She never quit tahajjud (night vigil). She gave so much of her time to worshiping acts that she was titled as "'Abidat Al 'Ali" (the female worshiper of the family of Ali). On the tenth and eleventh eve of Muharram 61/October 680 and after the martyrdom of her brothers, her children, and many of her relatives she did not abandon her acts of worship. Fatima bt. al-Husayn (a) said, "On the eve of Ashura, my aunt (Zaynab) was worshiping, praying and crying for all the night." It is narrated that Imam al-Husayn (a) told her at his last moment on the day of Ashura, "O, my sister! Do not forget me in your night prayers." On the day of Ashura when she saw her brother's bloody body, she said, "O, Allah! Accept this humble sacrifice from us." She rescued Imam al-Sajjad (a) from death several times, one of which was in the court of 'Ubayd Allah b. Ziyad after that Imam al-Sajjad (a) debated with him, he ordered to kill the Imam (a), but Zaynab (a) put her hand around Imam's neck and said, "As long as I am alive, I do not let you kill him." "O, days! Fie upon your friendship!, How many of your fellows and seekers, are killed in mornings and evenings?, and the days are not content with substitutes (other than the lives of people). The Majestic (Allah) is in charge of this affair, and every living creature will go through this path (will die). He repeated this poem two or three times until that I understood what he meant, I choked up but I kept silent and knew that tragedy has been sent down, but my aunt, like other women who are prevailed by their tender hearts, could not control herself. She jumped towards him and said, "Oh what pain! May demise deprive me of life! Today my mother, Fatima, my father, Ali, and my brother, al-Hasan died. You are the successor of the bygone ones and the last of the remainder." Imam al-Husayn (a) looked at her and said, "O, My dear sister! Do not let Satan take away your patience." then his eyes overflowed with tears and added, "If the bird is left alone, it will sleep." Then she said, "Oh, woe! Do they take your soul by force? This hurts my heart more and is more painful to me." Then she slapped her face and tore her clothes and fell on the ground losing consciousness. Imam (a) went to her and sprinkled some water on her face and told her, "O, my dear sister! Be content with Allah's will and know that the inhabitant of the earth will die and the inhabitant of heavens will not remain and everything will perish except Allah who has created all the creatures by His omnipotence and will resurrect them, they will return to Him and He is Single and the Only One. My father was better than me, my mother was better than me, my brother was better than me, and for me and for every Muslim there is good exemplar in the Prophet of God." He consoled her with this and other similar sentences and said, "O, my dear sister! I put you under this oath and please do not break it: never tear a piece of your clothes (as a sign of your sorrow) for me, never slap your face (for mourning) for me, and never invoke woe and perdition when I was slain." Then he accompanied her to my tent and went to his companions." In the evening of the day of Ashura, when Zaynab saw Imam al-Husayn (a) fallen on the ground and he was surrounded by his enemies who intended to kill him, she came out of her tent and shouted at Umar b. Sa'd (the commander of the enemy's army), "O, Ibn Sa'd! Is Abu Abd Allah (Imam al-Husyan) being slain while you are watching?" He did not reply and Zaynab cried, "Oh for my brother! Oh for my master! Oh for my household! I wish the heavens had been fallen upon the earth! I wish the mountains had been crumbled and scattered on plains!" And when she came to his brother's body, she said, "O Allah! Accept from us this sacrifice." Then she faced toward Medina and started addressing the Prophet (s), "Oh, Muhammad! These are your daughters! They are being taken captives! Your children are slain! The Zephyr is blowing on their bodies! And this is al-Husayn, who has been beheaded from the back of his neck! His turban and cloak have been plundered." "May my father be the ransom for the one whom the army plundered. May my father be the ransom for the one whose tents were taken down..."
Her words made both friends and enemies cry and wail. After Ashura, the captives were taken to Kufa. They were circulated around the city tragically. As they entered Kufa, Zaynab delivered a sermon, which influenced the people who had come to see the captives. Bashir b. Khuzaym al-Asadi said, "On that day, I looked at her. By Allah, I have never seen any proud and modest woman with that eloquence, it was as if she was talking with Ali's tongue. She told people to be silent. People became silent, even the bells on the camels stopped jiggling." When she finished the sermon, Kufa was filled with emotions and sadness. Some people were nipping their fingers (as a sign of regret and being shocked). After her sermon, there was a possibility of an uprising and riot against the government, thus, the captives were taken to Dar al-Imara (the palace of the ruler) to Ubayd Allah b. Ziyad. Zaynab spoke and debated with Ibn Ziyad, the governor of Kufa, in his palace. After the tragedy of Karbala, Yazid b. Mu'awiya asked Ubayd Allah b. Ziyad to send the caravan of captives along with the heads of the martyrs of Karbala to Damascus. Yazid's government was very strong at that time in Syria, as the people were bombarded with false information about the household of Imam 'Ali (a) and fake virtues and merits of descendants of Abu Sufyan. So it is not surprising that "when the household of the Prophet (s) entered Damascus, people had worn new clothes, decorated the city, musicians were playing songs and the city was filled with happiness." However, the sermons delivered by Imam al-Sajjad (a) and Lady Zaynab (a) changed the conditions in a very short time. They informed people about the tyranny of Umayyads and the horrifying act they did to descendants of the Prophet (s) in Karbala. Soon the enmity of the people of Damascus toward Ahl al-Bayt (a) changed to friendship and affection. Yazid who thought that killing of Imam al-Husayn (a) will help consolidate his governing position in Islamic world, realized that it has actually damaged his popularity and weakened his authority. Yazid had prepared an unprecedented ceremony in his court. He had invited all the elite officials, noblemen, and army commanders of Umayyads. In the presence of the captives, he recited blasphemous poems, talked about his victory and interpreted some verses of the Qur'an in support of his actions. "I wish my forefathers who were killed at Badr had witnessed, the worry of Khazraj from unsheathed swords. They would have been very happy and delighted, and would have said: "O Yazid! May your hand never be paralyzed". We have killed the masters of their chiefs and equated it with Badr, and it has been so, indeed. The Banu Hashim played with the Dominion, while no news from the Heaven had come, nor was there anything revealed. I am not a descendant of Khunduf if I will not seek revenge from Ahmed's descendants for what he did to us!" Reacting to these verses, Lady Zaynab uprose against him and delivered an eloquent sermon which proved the rightness of Imam al-Husayn (a) and the wrongdoing of Yazid. Her logical sermon influenced the attendance very much in a way that Yazid preferred to react gently and avoid harsh decisions. He consulted about the captives with Umayyad officials. Although some of them suggested killing the captives, Nu'man b. Bashir advised him to deal with them mildly and gently. Due to the enlightening of Zaynab, Yazid had to blame Ubayd Allah b. Ziyad for the martyrdom of Imam al-Husayn (a) and cursed him. Yazid allowed the captives to mourn for some days in Damascus. Umayyad women, including Hind, Yazid's wife, joined Ahl al-Bayt (a) in the ruin (where the captives where held), they kissed hands and feet of Ahl al-Bayt (a) and mourned for three days. 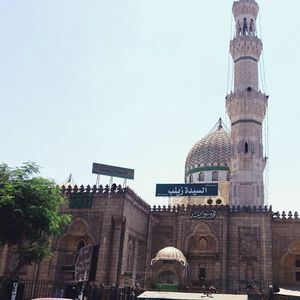 Finally the captives were returned to Medina with respect and reverence. Lady Zaynab (a) passed away on Sunday, Rajab 15, 62/April 2, 682. Some reported that she passed away on Rajab 14. Al-Baqi' cemetery: Some historians have reported that she was buried in al-Baqi', Medina. Al-Sayyid Muhsin al-Amin, the author of A'yan al-Shi'a, accepted this report and mentioned some evidence refuting the other two reports. Zaynabiyya: It is widely believed that she was buried in Zaynabiyya, a southern suburb of Damascus, Syria, where nowadays her shrine is. Maqam of Lady Zaynab (a): Some historians said that she was buried in Egypt. Her shrine in Egypt has been renovated several times and now is a ziyara site. ↑ Ibn Athīr, Usd al-ghāba, vol. 6, p. 132. ↑ Zubaydī, Tāj al-ʿarūs, vol. 2, p. 60. ↑ Kaḥḥāla, Aʿlām al-nisāʾ, vol. 2, p. 91. ↑ Sharīf al-Qarashī, al-Sayyida Zaynab, p. 39. ↑ Jazāʾirī, al-Khaṣāʾiṣ al-zaynabīyya, p. 44. ↑ Jazāʾirī, al-Khaṣāʾiṣ al-zaynabīyya, p. 52-53. ↑ Amīn, Aʿyān al-Shīʿa, vol. 7, p. 137. ↑ Ibn Athīr, Usd al-ghāba, vol. 6, p. 133. ↑ Mufīd, al-Irshād, vol. 2, p. 125. ↑ Kaḥḥāla, Aʿlām al-nisāʾ, vol. 2, p. 92-97. ↑ Maḥallātī, Rayāḥīn al-sharīʿa, vol. 3, p. 57. ↑ Ṭabrisī, al-Iḥtijāj, vol. 2, p. 109. ↑ Naqdī, Zaynab al-kubrā, p. 61. ↑ Maḥallātī, Rayāḥīn al-sharīʿa, vol. 3, p. 62. ↑ Fayḍ al-Islām, Khātūn-i du sarā, p. 185. ↑ Majlisī, Biḥār al-anwār, vol. 45, p. 117. ↑ Mufīd, al-Irshād, vol. 2, p. 93-94. ↑ Mufīd, al-Irshād, vol. 2, p. 112. ↑ Ibn Ṭāwūs, al-Luhūf, p. 159-161. ↑ Abū Mikhnaf, Waqʿat al-ṭaff, p. 259; Majlisī, Biḥār al-anwār, vol. 45, p. 117. ↑ Majlisī, Biḥār al-anwār, vol. 45, p. 59. ↑ Abū Mikhnaf, Waqʿat al-ṭaff, p. 259; Ṭabarī, Tārīkh al-umam wa l-mulūk, vol. 5, p. 348-349. ↑ Ṭabrisī, al-Iḥtijāj, vol. 2, p. 109-110. ↑ Ṭabrisī, al-Iḥtijāj, vol. 2, p. 113. ↑ Ṣādiqī Ardistānī, Zaynab-i qahramān, p. 246. ↑ Abū Mikhnaf, Waqʿat al-ṭaff, p. 299-300; Majlisī, Biḥār al-anwār, vol. 45, p. 117. ↑ Mufīd, al-Irshād, vol. 2, p. 115-117. ↑ Hāshimīnizhād, Darsī ki Ḥusayn bi insānhā āmūkht, p. 236. ↑ Muḥammadī Ishtihārdī, Haḍrat-i Zaynab, p. 327-328. ↑ Hāshimīnizhād, Darsī ki Ḥusayn bi insānhā āmūkht, p. 330. ↑ Muḥammadī Ishtihārdī, Haḍrat-i Zaynab, p. 248. ↑ See: Ṭabrisī, al-Iḥtijāj, vol. 2, p. 122. ↑ Abū Mikhnaf, Waqʿat al-ṭaff, p. 305-307; Ibn Ṭāwūs, al-Luhūf, p. 213. ↑ Ibn Ṭāwūs, al-Luhūf, p. 135; Majlisī, Biḥār al-anwār, vol. 45, p. 135. ↑ Ibn Ṭāwūs, al-Luhūf, p. 221; Majlisī, Biḥār al-anwār, vol. 45, p. 135. ↑ See: Suyūṭī, Tārīkh al-khulafāʾ, p. 158. ↑ Abū Mikhnaf, Waqʿat al-ṭaff, p. 311. ↑ Qazwīnī, Zaynab al-kubrā, p. 591. ↑ Sharīf al-Qarashī, al-Sayyida Zaynab, p. 298. ↑ Amīn, Aʿyān al-Shīʿa, vol. 7, p. 140-141. ↑ Sharīf al-Qarashī, al-Sayyida Zaynab, p. 299. Abū Mikhnaf, Lūṭ b. Yaḥyā. Waqʿat al-ṭaff. Edited by Yūsifī Gharawī. Second edition. Qom: al-Majmaʿ al-ʿĀlamī li-Ahl al-Bayt, 1427 AH. Amīn, Sayyid Muḥsin al-. Aʿyān al-Shīʿa. Edited by Ḥasan al-Amīn. Beirut: Dār al-Taʿāruf li-l-Maṭbūʿāt, 1406 AH. Fayḍ al-Islām, Sayyid ʿAlī Naqī al-. Khātūn-i du sarā sayyidatunā Zaynab al-Kubrā. Second edition. Tehran: Nashr-i Āthār-i Fayḍ al-Islām, 1366 Sh. Hāshimīnizhād, Sayyid ʿAbd al-Karīm. Darsī ki Ḥusayn bi insānhā āmūkht. Eleventh edition. Mashhad: Hāshimīnizhād, 1369 Sh. Ibn Athīr al-Jazarī, ʿAlī b. Muḥammad. Usd al-ghāba fī maʿrifat al-ṣaḥāba. Beirut: Dār al-Fikr, 1409 AH. Ibn Manẓūr, Muḥammad b. Mukarram. Lisān al-ʿarab. Beirut: Dār al-Fikr, [n.d]. Ibn Ṭāwūs, ʿAlī b. Mūsā. Al-Luhūf. Edited by ʿAqīqī Bakhshāyishī. Fifth edition. Qom: Daftar-i Nashr-i Nawīd-i Islām, 1378 Sh. Jazāʾirī, Sayyid Nūr al-Dīn al-. Al-Khaṣāʾiṣ al-zaynabīyya. Qom: Intishārāt-i al-Maktaba al-Ḥaydarīyya, 1425 AH. Kaḥḥāla, ʿUmar Riḍā. Aʿlām al-nisāʾ fī ʿālamay al-ʿarab wa l-islām. Beirut: Muʾassisat al-Risāla, 2008. Maḥallātī, Dhabīḥ Allāh. Rayāḥīn al-sharīʿa. Tehran: Dār al-Kutub al-Islāmīyya, 1349 Sh. Majlisī, Muḥammad Bāqir al-. Biḥār al-anwār. Third edition. Beirut: Muʾassisat al-Wafāʾ, 1403 AH. Mufīd, Muḥammad b. Muḥammad al-. Al-Irshād. Qom: al-Muʾtamar al-ʿĀlamī li-Alfīyat al-Shaykh al-Mufīd, 1372 Sh. Muḥammadī Ishtihārdī, Muḥammad. Haḍrat-i Zaynab furūgh-i tābān-i kawthar. Third edition. Tehran: Burhān, 1379 Sh. Naqdī, Jaʿfar al-. Zaynab al-kubrā bt. al-Imām. Najaf: al-Maktaba al-Ḥaydarīyya, 1361 AH. Qazwīnī, Sayyid Muḥammad Kāẓim al-. Zaynab al-kubrā min al-mahd ilā l-laḥd. Qom: Dār al-Ghadīr, 1424 AH. Ṣādiqī Ardistānī, Aḥmad. Zaynab-i qahramān. Tehran: Muṭahhar, 1372 Sh. Sharīf al-Qarashī, Bāqir al-. Al-Sayyida Zaynab Bāṭalat tārīkh wa rāʾidat al-jihād. Beirut: Dār al-Maḥajja al-Bayḍāʾ, 1422 AH. Suyūṭī, ʿAbd al-Raḥmān b. Abī Bakr al-. Tārīkh al-khulafāʾ. Edited by Ḥamdī. Riyadh: Maktabat Nazār Muṣṭafā al-Bāz, 1425 AH. Ṭabarī, Muḥammad b. Jarīr al-. Tārīkh al-umam wa l-mulūk. Cairo: Maṭbaʿat al-Istiqāma, 1358 AH. Ṭabrisī, Aḥmad b. ʿAlī al-. Al-Iḥtijāj. Edited by Ibrāhīm al-Bahādurī. Qom: Uswa, 1413 AH. Zubaydī, Murtaḍā. Tāj al-ʿarūs. Beirut: Dār al-Fikr, 1414 AH.